The Federation of Canadian Municipalities (FCM) called the budget “a big win for Canadians” and says it will “transform the way we build cities and communities and marks a new era of federal-municipal partnership.” They like the investments the government is making in housing, transit, and green infrastructure, as well as the “new cost-sharing funding model” that will have a shorter-term impact while longer-term funding agreements are worked out. The budget outlines a five-year, $11.9 billion infrastructure spending plan. There’s a focus on public transit, with $3.4 billion over three years being invested according to each province’s share of national ridership. For Alberta, with 10.28% of Canada’s public transit ridership, that works out to just over $347 million. There’s also an increase in eligible costs for public transit projects up to 50% which is a big improvement. Another $2.3 billion of the infrastructure plan will go to affordable housing over two years, $739 million of which is for investments in housing for First Nations, Inuit, and Norther Communities. About $112 million of the affordable housing allocation is to help cities tackle homelessness. Budget 2016 extends EI regular benefits by 5 weeks, but only in three of Alberta’s four EI regions – not in Edmonton. That’s because we did not experience a large enough increase in our unemployment rate between March 2015 and February 2016. Provincially the changes could be worth about $380 million. Like all cities, Edmonton faces major challenges around the maintenance and replacement of aging infrastructure. Budget 2016 includes funding of $50 million for infrastructure management and measurement, which should help cities collect the data required to inform decision-making. Getting a better handle on the project will be a good thing. 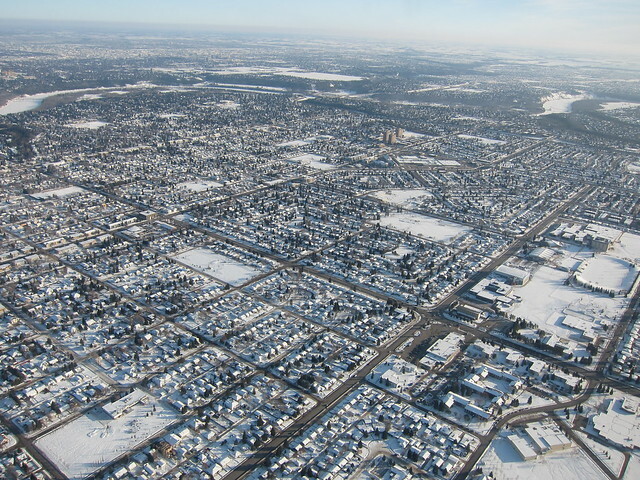 As mentioned a couple of days ago, Council is revisiting the discussion about sprawl in our city thanks to a report that projects the City will face a $1.4 billion shortfall after building out the three Urban Growth Areas. On top of this, another $8.3 billion in non-residential assessment growth is needed to maintain the current ratio of residential to non-residential tax assessment. That’s the real reason the City is pursuing annexation, though you won’t find it in the “three reasons for annexation”. The word “sprawl” is carefully avoided in both the editorial and the mayor’s post. But that’s what it is. One of the three Urban Growth Areas is Riverview, where planning for neighbourhoods is well underway. Names were proposed for five neighbourhoods, and both the developers and the Naming Committee agreed on two: Grandisle and White Birch. The other three names proposed were “The Uplands”, “Red Willow”, and “River’s Edge” but the Naming Committee went with “Balsam Woods”, “Golden Willow”, and “River Alder” instead. The developers appealed, which is how the issue came before Council today. We already have The Uplands of Mactaggart too. Maybe that’s how we can solve our sprawl problem!